The Dinosaur Museum at Hwy 76 is one of the most fascinating attractions in Branson where the whole family is sure to enjoy an awesome tour with the prehistoric animals. When you visit Branson and want to see exciting attractions, museums and interesting things to do, don’t miss to visit Branson Dinosaur Museum. In this amazing museum, you will travel back in time in just a few steps and see life sized dinosaur replicas, fossils, and experience a frightening situation. This museum will give you the chance to get up close and personal with the small four-winged microraptor, a dinosaur that measured only one-foot tall and considered the most abundant of non-bird dinosaurs. The monstrous tyrannosaurus rex, which is everyone’s favorite, fondly referred to as TRex, a beast with a huge skull, balanced by a long and heavy tail. These perfectly constructed gigantic creatures are exquisitely detailed, that you can imagine they’ll come to life at any moment. The detailed works are courtesy of talented paleoartists who used actual dinosaur bones to mold incredible body forms. 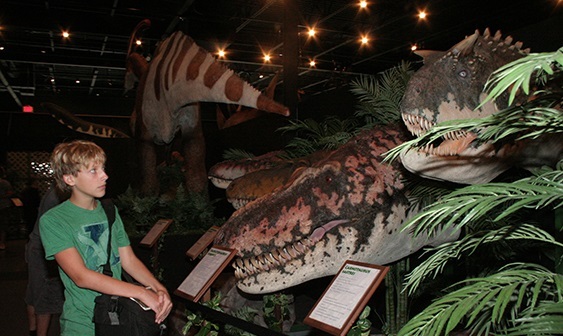 At Dinosaur Museum in Branson, you can spend as much time as you wish with the prehistoric friends. The tours at the museum are self-guided and each dinosaur is displayed with complete descriptions to give you ideas about their habits, their scientific name, and more. Touring the museum is a good opportunity to learn how incredibly different the monstrous creatures are as compared to today’s animals. As you tour around the museum, you’ll discover plant-eating dinosaurs – herbivores, and meat-eating animals – carnivores. You’ll find more at the museum such as fascinating fossil exhibit, a souvenir from the gift shop that you can take home, a learning center, and an area to hold a party. As one of the most amazing attractions in Branson, Dinosaur Museum has the largest collections of prehistoric animals in the world. As you take your journey through various entertaining and educational exhibits, you will be able also to view flying creatures, giant sea lizards as well as replica skeletons, skulls, and bones of some of the most famous dinosaurs. There are also hands-on activities that await children such as the educational HD movies show in the on-site theater, coloring stations, fossil dig, books, and more. Dinosaur Museum also features LCD screens in each room with a narration explaining what the dinosaur could actually do or not. “Scavenger Hunt Quiz” is another great feature in the museum which gives visitors the opportunity to learn more about dinosaurs. As one of the highlights of the museum, the T-Rex is considered king of dinosaurs and king of meat eaters which could mean “tyrant lizard king”. If you are looking for a beautiful spot for taking pictures, head on to the lobby of the museum where T-Rex is wonderfully displayed towering above everything. The Dinosaur Museum is one of the most popular tourist attractions in Branson where you can see the replicas of monstrous prehistoric creatures that have ever lived on earth.